If you have a damaged or badly decayed tooth, a dental crown can restore its strength and appearance. A dental crown is a custom cap that completely covers the surface of a reshaped tooth. Dr. Jon Marc Van Slate works with a high-quality lab and offers dental crowns in a range of materials at his Houston, TX, practice. To discover if a crowning treatment is right for you, schedule a consultation today. Crowns are available to virtually all patients who are maintaining good periodontal (gum) health. When you visit our practice for a consultation, we will examine your tooth and discuss the full benefits of dental crowns to determine if this treatment is right for you. Receiving a dental crown is a two-step process. During your first visit, Dr. Van Slate will remove any decayed portions from your tooth and clean it thoroughly. Next, he will carefully remove enamel to reshape the tooth to a smaller size. This step is performed to create a strong bonding surface and ensure that your crown will be properly aligned with surrounding teeth. We will then use our innovative iTero® intraoral scanner to take a detailed 3-D impressions of your reshaped tooth. When compared to traditional impressions, the iTero® creates a much more precise digital image. The images will be uploaded to a computer and sent to an advanced off-site lab, where skilled technicians will custom craft your crown. In addition to crowns made of traditional metal amalgam, we also offer crowns in a range of materials that can be closely matched to the shade of your smile. 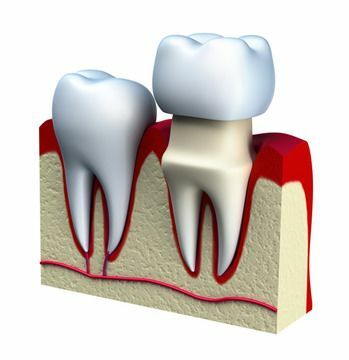 These materials include dental-grade porcelain as well as IPS e.max® ceramic, which is extremely lifelike and durable. A custom dental crown from our practice can provide a diverse range of restorative and cosmetic benefits. The process to create your crown can take a few weeks, and we will provide a temporary crown for you to wear during this time. Furthermore, we may be able to rush production for a faster turnaround time, depending on your needs. When you return to our practice for your final appointment, we will ensure your crown fits comfortably and blends flawlessly with your smile before bonding it in place. Dr. Van Slate will also assess your bite and make any adjustments, if necessary. Dr. Van Slate is committed to undergoing continued education and using cutting-edge advanced technology to provide patients with oral care services of the highest quality. A custom dental crown from our practice can provide a diverse range of restorative and cosmetic benefits. To learn more about dental crowns, reach out to a member of our friendly staff today.